From Poe’s tortoiseshell beauty, Catarina, to Bill and Hilary Clinton’s bi-colored presidential pet, Socks, there have been famous felines behind famous celebrities for centuries. Our cats are daily inspiration to us, and the fact that so many noteworthy names had cats reminds us that even celebrities are not immune to their charms. The first Siamese cat in the U.S., appropriately named Siam, was given to President Rutherford B. Hayes in 1878 by the American Consul in Bangkok. In the first term of Clinton’s presidency, Socks, a black and white tomcat, served as First Pet. He was eventually usurped by the Labrador retriever, Buddy, and not happy about it. Said President Clinton, "I did better with the Palestinians and the Israelis... than I've done with Socks and Buddy." In an act that sparked controversy, the Clintons left Socks behind with Presidential Secretary Betty Currie when they moved out of the White House. Current President George W. Bush is no stranger to felines either. He and Laura own two cats, Ernie and India “Willie” Bush. If you love the Broadway musical, Cats, you have the Nobel Prize-winning poet and playwright T.S. Eliot to thank. Eliot penned a book of feline poems, titled “Old Possom’s Book of Practical Cats,” which was picked up by composer Andrew Lloyd Weber many years later and turned into the award-winning and much-loved musical. The broody master of suspense, Edgar Allen Poe, might have given cats sinister qualities in many of his stories, but he treasured his own tortie, Catarina. If your read, and shivered, your way through 'The Black Cat,’ now you know who the inspiration was for that spine-tingling tale. Beverly Coney Heirich is the author of “Mornings with Fulton Sheen,” a book that achieved national bestseller status at Catholic bookstores across the country. 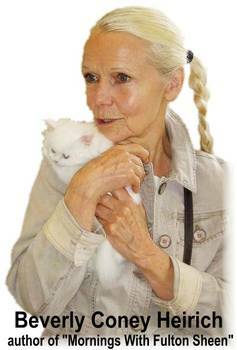 While working on her next book, “Guide for the Perplexed: The Right and Wrong Book,” Beverly enjoys the company of her blue-eyed white Persian named Perpetua. She says that her adventurous Bou Baby is “…the smartest, prettiest,healthiest, and naughtiest kitten in the whole wide world,” and enjoys climbing tall bookcases and exploring dark places. Ironically, despite his canine-related moniker, Snoop Doggy Dog actually loves cats. He has two Siamese beauties: one named Miles Davis and the other, Frank Sinatra. I take Kabuki out a lot, too, on little jaunts and he is so great in the car, when I'm not driving, he just sleeps upside down on my lap! I love it!!! I also attached a few photos from the "14th Annual Lint Roller Party" I recently attended. It is a wonderful charity event that raises money for animal rescues. The red carpet event is always fun and draws a lot of celebrity guests! Charlize Theron is the event's spokeswoman. They always tell celebs we can bring our pets, so I had to bring little Kabuki along! I put him in his little leopard print harness and attached him into my Louis Vuitton bag. He did so well even with all the cameras flashing at him! Everyone was in awe of his beauty and how calm and sweet he was! He must have gotten a hundred pets and snuggles! I later settled into the VIP lounge to let him relax, and he fell asleep on my lap! Some of the celeb guests had to come and give him a pet, Chad Lowe (24, ER) even held him for awhile! He was the hit of the event!!! I just have to say again how wonderful Kabuki is! He truly is everything I could have wanted and I love him so much! Thank you for raising such an amazing and well adjusted kitten! [...] Kabuki sends you his love." James Dean was given a cat named Marcus by Elizabeth Taylor. He sent Marcus to a girlfriend to watch the night before he was killed while driving his silver Porsche 550 Spyder in 1955. Actress Cameron Diaz has a cat named Little Man. She has been spotted out and about, shopping for kitty outfits. Her boyfriend, N’Sync’s Justin Timberlake, also owns a cat named Alley. 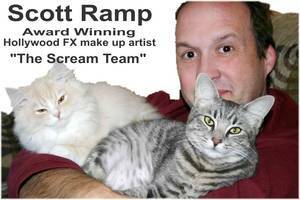 Scott Ramp is an award-winning makeup artist who honed his talents in creating horrific makeup effects in Hollywood and during his 14 years as a college-level makeup instructor. In 1995, he created “The Scream Team,” to share tips, techniques and hand-made materials with individuals who want to “up the quality” and add scream factor to everyday Halloween costumes. Scott and his wife Barbara adopted our playful, cream-and-white Ragaper Bou Baby, named Elliot. The notables listed above treasure their cats because they know what we know: that there is no better pet for companionship, unconditional love, and intelligence. The French critic and historian, Hippolyte Taine, said it best: "I have studied many philosophers and many cats. The wisdom of cats is infinitely superior." Visit our In the Spotlight page to see some of our kittens become celebrities! !